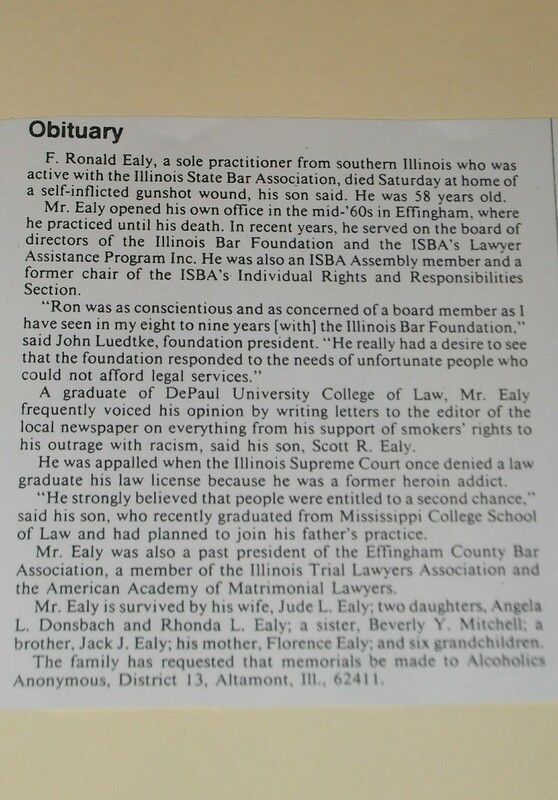 Today would have been the 75th birthday of my late father, F. Ronald Ealy. His death was traceable to a lifelong battle with alcoholism combined with bipolar disorder, a malady that I learned about only after his death (in 1993). I don’t reflect very often these days on the life of my father and sometimes feel odd when others bring up his name. It catches me off guard. Although often hyper-critical at home, he was incredibly inactive as a father. [Example: Although he was not in ill health and played baseball when he was younger, we probably played “catch” fewer than five times in my childhood years. Later, as I played four years of college tennis on scholarship, he never once showed up at a match]. My mother, however, did a commendable job of making up for his weaknesses. I always felt a strong desire to be patient and kind and involved with my own (wonderful) children – owing more than anything to her strong influence. In reality, I inherited next-to-nothing from my father – other than an occasional chip on my shoulder. When he died, he left my mother and me in a terrible situation, and the way he treated my sisters was simply awful. This was not the way that he wanted to be. But, as is the case with many impaired individuals, it is the way that he was. « Cell Phones, Computers As Contraband?